Create your own tie-up valances for an economical way to add warmth and chic elegance to any room. 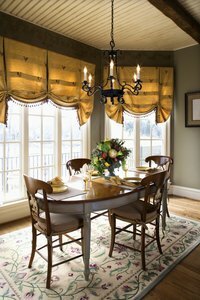 Tie-up valances are simple to make with minimum sewing skills required. Because of the minimalist design, these tie-up valances require less material than traditional window treatments. Recycle old curtains and ribbon to make this project even more economical. You can also add beads and other embellishments to give these valances a truly original and personal signature. Cut the fabric to measure the window. Allow 2 extra inches for the width and 3 1/2 extra inches for the length of the fabric. Pin one strip of ribbon across the width of the fabric 8 inches from the top. Attach another strip of ribbon to the other side of the material so that the ribbons are matched up on opposite sides. Sew the ribbons in place. These will act as an anchor for the valance ties. Create the rod pocket by folding the material 1/2 inch at the top. Iron the 1/2-inch fold. Fold the fabric again 2 inches and iron. Use straight pins to hold the rod pocket in place. Sew the seam allowing a 2-inch space for the curtain rod. Fold the left side edge of the fabric 1/2 inch and iron in place. Create another 1/2-inch fold and press with iron. Secure with straight pins and sew. Repeat for the right side and bottom portion of the fabric. Cut four pieces of ribbon of equal size to serve as ties for the valance. The ribbons should measure the length from the anchor ribbons attached earlier to the bottom hem of the fabric. Sew the end of one ribbon, 6 inches from the edge of the fabric, to the anchor ribbon on the left front side. Attach another end of ribbon to the anchor ribbon on the right front side 6 inches from the edge. Repeat with the other two ribbons on the opposite side, and your curtain is ready to be converted into a tie-up valance. Simply roll the curtain up and secure with the ties.